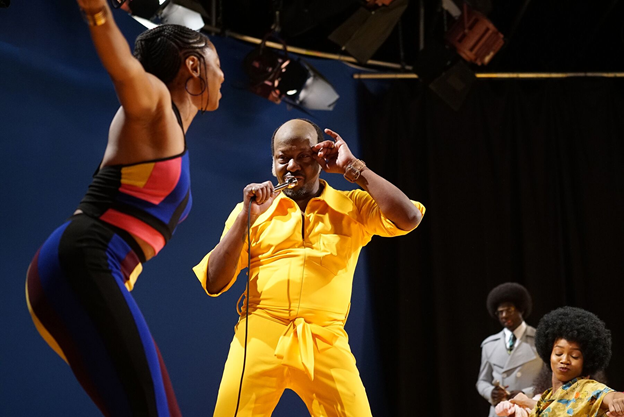 Bobby Brown follows his hit BET biopic “The Bobby Brown Story”, with a comedic guest star turn as soul singer Rufus Thomas. Sporting a notable paunch and wild outfit, Rufus Thomas brings a spectacle to Soul Train when he performs his signature song “Do the Funky Chicken.” As a Grammy® Award-winning music artist, Bobby Brown’s career has spanned over 4 decades as an original member of New Edition and his own successful solo journey. Named one of Billboard Magazine’s Top 60 Male Artists of All Time this year, the artist continues to tour today with newly minted group, RBRM (Ronnie, Bobby, Ricky & Mike). No stranger to BET’s audiences, he has been the subject of two hit mini-series on the network, “The New Edition Story” and “The Bobby Brown Story”.